"Top 35 Mistakes Danes Make in English" is an entertaining guide to "typiske sprogfejl på engelsk" - the small mistakes Danes make again and again when speaking or writing English. When should you say lend and when should you say borrow? What's the difference between effective and efficient? Does your business have customers or costumers? And why is competent not really a compliment in English? Based on Kay Xander Mellish's 17 years of correcting Danish corporate texts, this little book will help you feel more confident when speaking English. You can also work with Kay to personalize a version of the book for your company or industry. The 88-page paperback version of "Top 35 Mistakes Danes Make in English" is a great gift for a new graduate or a student or colleague planning to live abroad. It also makes a great "kalendergave" or "mandelgave" around the holidays. 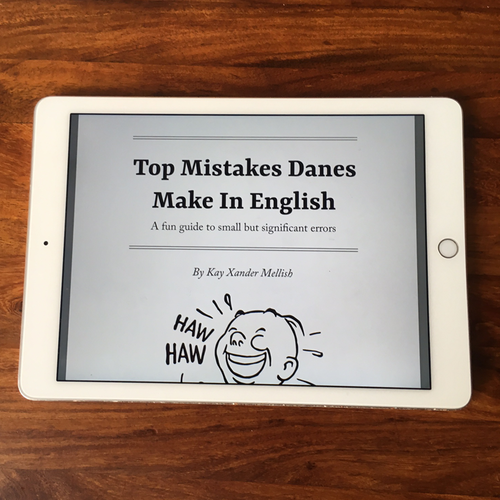 The eBook version of "Top 35 Mistakes Danes Make in English" downloads immediately and can be read on any tablet or smartphone. You can get it directly through our store or via Amazon, Saxo.com, the iTunes store or Google Play. You can listen to Kay Xander Mellish read the audio version of "Top 35 Mistakes Danes Make in English" on Amazon Audible or Saxo.com lydboger. We're also looking forward to making the audiobook available on Mofibo and Storytel as soon as possible.